Enhance the Members and Groups Directory pages of Kleo theme with geolocation and mapping features. Groups search compatible with BuddyPress 2.7 and higher. Fix: Disable groups geolocation feature if Groups Locator add-on is disabled. Tweak: New checkbox in settings page to disable Members and Groups geolocation features. Feature: added support for BuddyPress groups ( requires Groups Locator add-on ). Feature: \"reset form\" trigger to clear form to default state. Tweak: Improve Location tab styling to better match Kleo theme style. Feature: Display results map anywhere on the page using a shortcode ( see GMW Kleo settings page ). Feature: Choose the address fields that will be displayed per member in search results. With Kleo Geolocation extension you can provides your visitors with mapping and proximity search feature for the Memebrs and Groups Directory page of the Kleo theme developed by Seventh Queen. “You no longer need to be a professional developer or designer to create an awesome website. Easily create a stunning community, company presentation, mobile website or membership website. Create the site of your dreams now. The extension enhances the functionality of the Members and Groups Directory page of the Kleo theme with geolocation, mapping and proximity search features. When using the Members and Groups Directory page by default, you can only search for members or Groups by name. With Kleo Geolocation extension you can also search for members and groups based on address, distance, and units. The search results can be ordered by the distance and you can choose to display a Google map showing the members or groups location. After activating and settings up the extension, all the geolocation features will be dynamically applied to the Members and Groups Directory pages dynamically. No additional code required. Kleo Geolocation extension uses the address and radius entered in the search form to perform a proximity search query, and return nearby members or groups. When the search form is submitted, the extension geocodes the address, and search for members or groups based on their location ( latitude and longitude ), which is saved in the database. The results are accurate, can be sorted by the distance, and can be displayed on Google map. Members Locator core extension ( providede in GEO my WP core plugin ) for integration with the Members Directory page. Buddypress Groups Locator premium extension for integration with the Groups Directory page. 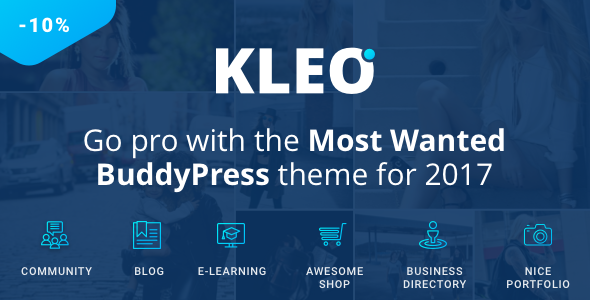 All the features described below can be applied to any or both the Members and Groups Directory pages of the Kleo theme. To enable the features on the Members Directory page you need to have the Members Locator core extension activated ( free extension included in GEO my WP core plugin ). To enable the geolocation features in the Groups Directory page, Buddypress Groups Locator premium extension is required. Search for BuddyPress groups or members based on location. Enter an address, radius, and units, and see results nearby. The list of results can be sorted by the distance and can be displayed on Google map. Enable Google Places address autocomplete to display live suggested results while typing an address. Enable Locator button inside the address field to help visitor to find their location automatically. Set a default radius value, or let the visitors choose by enabling a dropdown select box with multiple radius values. Set a default value as miles or kilometers, or let the visitors choose using a dropdown select box. When searching for groups or members using an address, the visitor can order the list of results by distance. This way they can see which members or groups nearest to their location. Enable Google map to show the location of the memebrs or groups found in search results. Click on a map marker will open info-window showing details of that memebr or group. You can set the height and width of the map, select the map type and the zoom level. You can choose to display the map above the list of results, or anywhere else on the page using the shortcode. Group map markers together when too close to each other to easily view them. Display the address, distance and “get directions” link for each member or group in the list of result. Easily setup the geolocation features via GEO my WP admin’s settings page.